"The sudden success of our website has come to us in many ways." 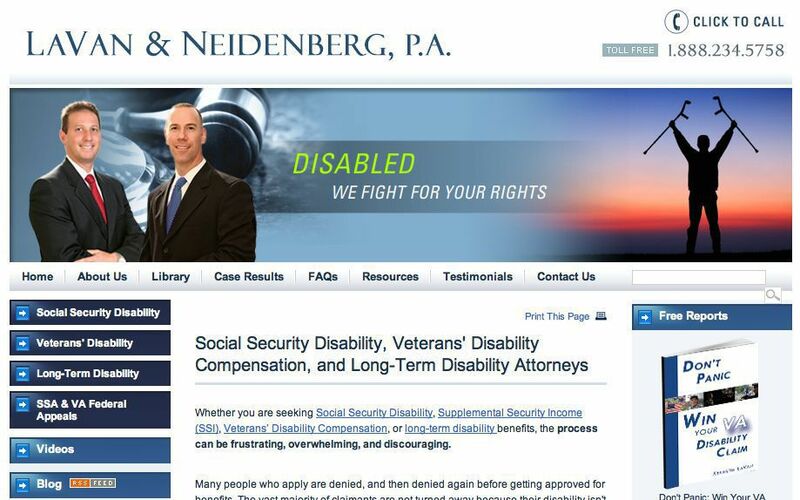 The Law Offices of LaVan & Neidenberg specialize in representing disabled individuals. Over the past several years the firm has maintained www.DisabilityLawClaims.com. Prior to hiring Foster Web Marketing, LaVan & Neidenberg did not have much success marketing on the web and were eager to obtain the results they knew other lawyers were getting. In April 2008, the firm hired Foster Web Marketing with a goal of getting real cases from search engines and a return on their internet investmest. Building on Tom Foster's advice, their strategy is not that complicated but is highly effective. They post at least 50 original content items on their site every week in the form of blogs, FAQ's, case results and videos. "Our site's launch occurred in early September 2008. And though we were told that it may take about three months to be ranked by Google, we were ecstatic to learn that our website had been ranked by Google and attracting over 1500 visitors in its first month! In October 2008, the majority of our web pages rank between 3 and 4 out of 10 and attract close to 4800 visitors (an increase of almost 300%!) The sudden success of our website has come to us in many ways." But they are not just blasting out content. First, they figure out what people are searching for and then write articles that answer the questions their prospective clients are asking. "Google Analytics can be a powerful tool if you use it to your advantage. We review our numbers every day and analyze what people are searching for which helps us tremendously when deciding what that week's content will be." Once the content is written, it has to be optimized for the search engines or no one will ever find it. "Something else we believe has contributed to our website's traffic, is giving page titles the reverence they deserve. During a Foster Web Marketing webinar in September, Tom stressed the importance of page titles and we ran with it. By doing so we realized an immediate increase in the number of visits to our site." We encourage you to take a look at the site of LaVan & Neidenberg for yourself. They have taken the right approach to marketing on the web and stuck with it. Download Tom Foster's free book 5 Biggest Mistakes 99% of Lawyers Make With Their Attorney Website That Costs Them Billings and Cases.